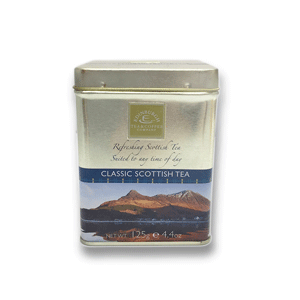 Direct from Scotland's finest purveyor of teas, Edinburgh Tea & Coffee, you'll enjoy these flavorful teas. Available in loose leaf or tea bags, it's your choice. 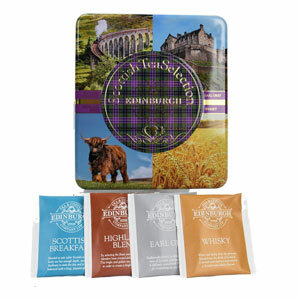 Enjoy four teas - Thistle, Heather, Whisky and Scottish Breakfast teas. The Forth Bridge you saw outside Edinburgh is on this tin of premium blended black teas perfect for an evening tea. Traditional Scottish Breakfast teabags are tucked inside this tin with a Scottish loch photo. 25 tea bags of Scottish Breakfast Tea - a blend of Assam, Ceylon and African teas. A gentle golden blend of black teas, packed in 25 individual tea bag sachets so you can take it with you anywhere. A blend of Assam, Ceylon and African tea for bold morning flavor - 4.4 oz. tin tea caddy. A blend of African and Assam tea with Scottish heather blossoms for flavor and aroma. 4.4 oz. tin tea caddy. Twenty-five teabags in this smooth blend of African and Assam teas with heather blossoms. Pure China tea marinated in malt whisky makes this tea special. 4.4 oz. tin tea caddy. 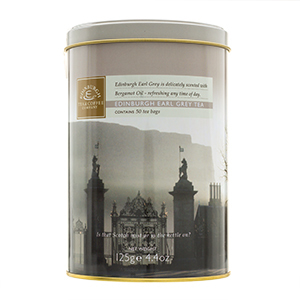 The gates of Holyrood Palace grace the outside of this tin protecting 50 teabags of rich Edinburgh Earl Grey tea. Enjoy this rich blend of tea anytime of the day. 4.4 oz. tin tea caddy. 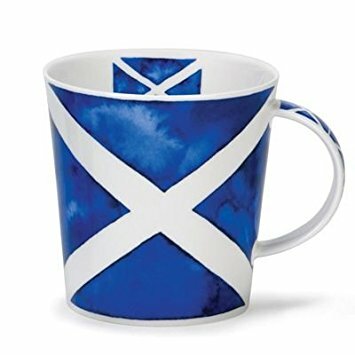 Bold Blue Saltire completely surrounds this oversized Dunoon bone china mug. 16.2 oz. 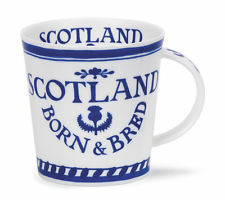 Declare your pride of Scottish ancestry with this oversized bone china mug. 16.2 oz.